Capital One never called back, but the mysterious $299 pending charge has disappeared. Had to endure another three-day "pre-authorization" wait to get a prescription refilled. It irks me that some clerk at an insurance company can interfere with the treatment prescribed by a board-certified physician with 20 years of experience. Speaking of medical stuff, got my flu shot yesterday and beat the rush. Here's hopiing they guessed correctly about the strains that will be prevalent this winter. According to the manufacturer's website, it takes about three weeks to develop whatever immunity the vaccine will provide and, if I'm reading the chart correctly, it's supposed to be 60% effective, which, frankly, doesn't inspire confidence. But I haven't had influenza for seven years running now. I did spend three days in the hospital in 2012 with mycoplasma pneumonia, a bacterial infection for which there is no effective vaccine. I asked my doctor about those pneumonia vaccine commercials which promise protection from 13 strains of the illness. He pointed out there are about 30 different types of pneumonia, and the two times I had it (another time back in the '80s), it was mycoplasma and therefore the vaccine would be ineffective. Incidentally, mycoplasma pneumonia is commonly referred to as "walking pneumonia." Still no vaccine for the boogie-woogie flu, either. Pumpkin, the 19+ year old feline and senior lesser mammal is going to the vet today for her feline distemper vaccine. More importantly, I hope to find out the cause of a recent bout of ongoing hair loss (not shedding) and atypical behavior. Veterinarians are surprised when they discover her age. Her blood panels and dental condition are like those of a ten year old cat, at least at her last visit two months ago. She's taken to lying at the top of the steps and staring into space, unresponsive until you actually touch her. Her age is equivalent to a human in her mid-90s, so it's perhaps not unusual, but the rapid onset of the behavior has us concerned. 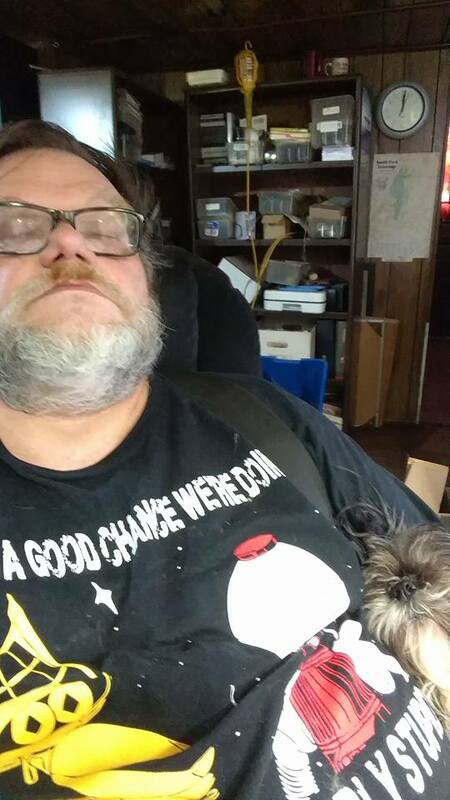 And tomorrow, the small, insane dog-like creature, Pixie the Shih Tzu, goes in to be spayed, have a breed-typical minor umbilical hernia repaired, and to have some deciduous (baby) teeth removed. In some dogs, the baby teeth don't fall out. This is also not unusual in Shih Tzus. My first job out of high school was veterinary assistant. I've seen scores of spays, neuters, and other surgical procedures performed. The Doc never lost a patient or, for that matter, had to deal with any complications. That was 45 years ago, and there've been significant improvements in anesthesia and surgery procedures, but I have to confess I'm worried about the little stinker. Small dogs (she's 12.5 pounds) and brachycephalic breeds, including Shih Tsus, have more problems with anesthesia. They can suffer from hypothermia and hypoglycemia, and the squished face can cause breathing problems. Anesthesia deaths in canines is rare, about 1 in 2000 (0.0005%). SHe's young and healthy, though, so I'm not going to worry about the surgery. Instead, I'm going to worry about how I'm going to keep that Elizabethan collar on her and prevent her from hurling herself from beds and couches, one of her favorite activities. Her other favorite activity is napping with Dad. We'll try to focus on that. Where's Samuel L. Jackson when you need him? The letter from Capital One said a data breach at a local merchant had possibly compromised my credit card, and that they were sending me a new one. A few days later, a new, security chip imbued card arrived with orders to destroy the old card and active the new one immediately. This past Monday I had a medical appointment. As I was sitting in my car preparing to leave, I quickly scanned my email and saw an urgent message from Capital One with the subject line "Please confirm your recent purchases." "Our fraud defenses flagged one or more purchase(s) below as unusual for your MASTERCARD PLATINUM card ending in xxxx. Do you or an authorized user recognize these purchases?" The email listed $2,100 in purchases from Saltwater Aquarium. These were obviously bogus purchases, so I clicked on the "Something's Wrong" button within the email, which sent me to a web page that told me to call their fraud department immediately. Not wanting to have what was undoubtedly going to be an animated conversation in a moving vehicle, I waited until I got home. I logged into my account on Capital One's website and noted the three offending purchases were posted under "Pending Transactions" and that their presence there had reduced my available credit balance to zero. I called the number on the back of the card, bounced through a number of recorded option selections, then finally was connected to a human being with- sigh- a heavy Indian accent. I explained the Saltwater Aquarium purchases were not made by me and that, rather significantly, they were charged to my old credit card number, the one they replaced with the new card after they had supposedly closed that account and opened a new one. The customer service rep explained that the old card was still "tied" to the new one. "The charges on the old card number were made three weeks after I activated the new card. Why would that old number still be active? The customer service rep repeated that the old card was still "tied" to the new one, but offered no explanation why they would honor a card they had replaced. Profuse apologies were offered, and a new card, with a new number, arrived the next day via FedEx. The unauthorized charges still appear on my bill, offset by "purchase adjustments" which cancel them out. And today, a $299.98 "pending purchase" appeared, with no merchant name, designated as "other," and charged to the new replacement card I received on Tuesday. The website says "Pending transactions are deducted from your available credit. They are not final and may differ from the posted amount. Transactions in a pending status cannot be disputed and generally post within 5 days." I called Captial One, was bounced through two operators to a third who was, apparently, the person who put the $299.98 charge on my account today. However, she was not in, as she works Monday through Friday. I left a voice mail, to which her recording said she will respond withing two days. Stay tuned... Where's Samuel L. Jackson when you need him?